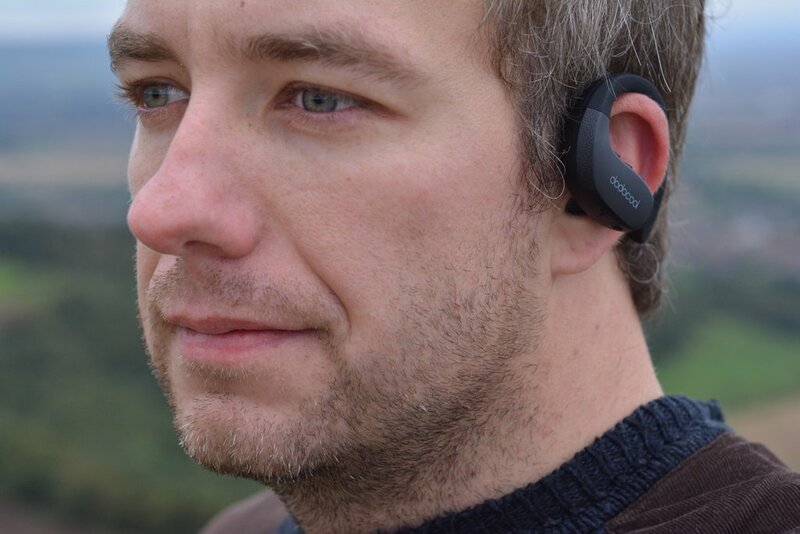 For some time I have been looking for a Bluetooth headset that would fit every scenario. I’m not sure if such headphones exist, however, I’m always happy to take a look and compare it to my trusty LG Tone 730. This time I’m reviewing theDodocool Bluetooth Headphones DA144. It’s a design I have not played with before, so I’m curious to see if the over the ear band fits the bill. If you have seen my previous reviews, there are three main aspects that I will focus on, especially if the product has the ‘sport’ word in its name. I’m going to take it running, cycling and do some general use. My previous experience with a totally wireless Bluetooth headset was a bag of mixed feelings. These were amplified by a poor battery life and troubled connectivity. 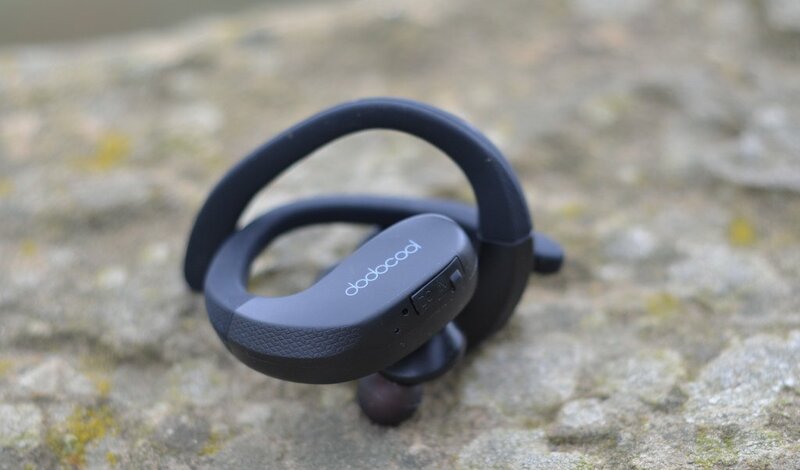 Right from the start, Dodocool Bluetooth Headphones DA144 offer up to 6h of use time, which I found more than I would need for even the longest sports session. The headphones fit well, the over-the-ear band is stiff but flexible enough to provide a secure fit. I won’t have to worry about losing it accidentally. Each headphone comes with 3 buttons, that double as volume, playback control, smart assistant functions and your usual call answering features. 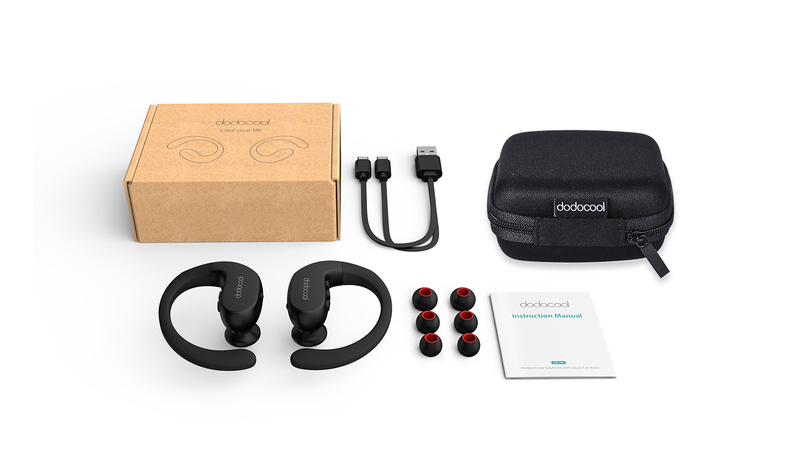 The Dodocool Bluetooth Headphones DA144 comes with a neat carry case and a Y-split charging cable so you could charge both of them at once. Another cool feature is the ability to pair multiple devices at once. 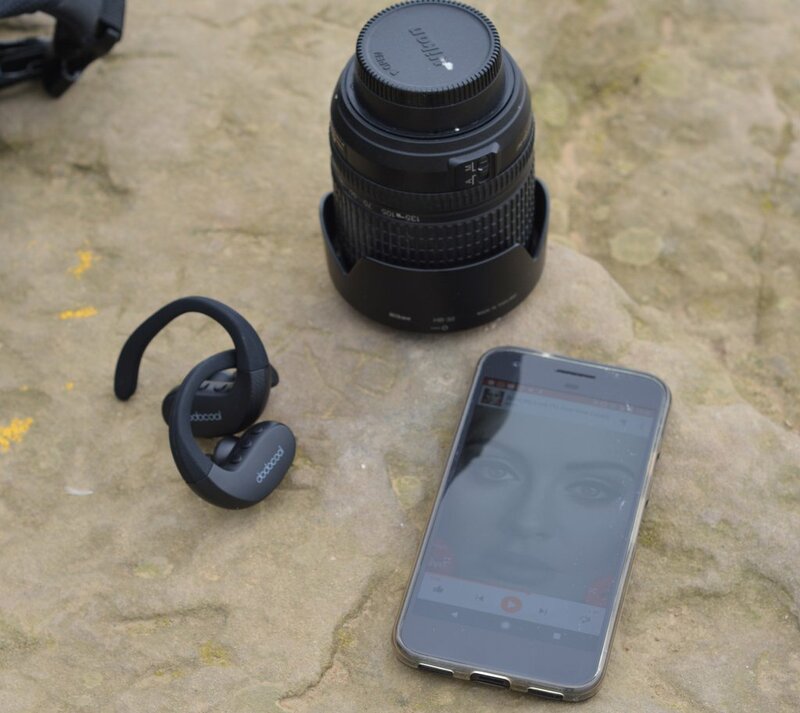 Each headphone can be paired with a separate phone and function as a typical Bluetooth headset. A very neat function, however, I only have one phone so I was not able to get creative with this. The Dodocool Bluetooth Headphones DA144 comes with a decent sound volume. The noise isolation is also adequate. The sound is nicely balanced, and while the sound profile doesn’t usually stand out on Bluetooth headset, I didn’t find myself missing out while listening to music via this headset. There is enough bass to keep your heart pumping strong during the exercise, and the hight tones will accent well acoustic versions of your songs. Overall, I’m pleased with the sound quality. I usually run with LG Urbane smartwatch only. I’m rocking the Android Wear 2.0 and some offline playlists. Taking my Pixel phone with me kills the joy of running as I want to carry as little as possible. This is where the biggest disappointment comes. I had VERY spotty results! The music would constantly cut off to the rhythm of my moving hand! Rebooting the watch, and pairing the headset again didn’t improve anything. I even moved the watch from one wrist to another to keep the master headphone closer to the Bluetooth source of music. No luck. I ended up cutting my running routine short, as the constant fade in/out music was too annoying to bear. My LG Tone 730 is not perfect in that regard, but the playback stutters only occasionally. The running performance with Dodocool Bluetooth Headphones DA144 paired with Google Pixel phone was satisfactory. I just don’t like to keep my phone with me when running. 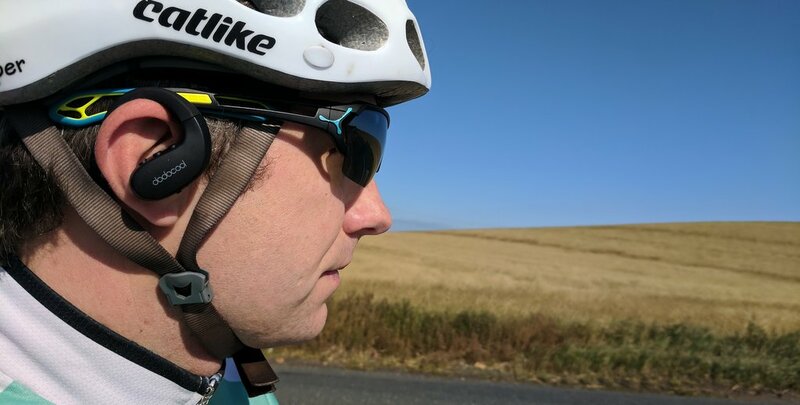 fiddly compatibility with glasses or helmets – I was able to find a comfortable position in which glasses, helmet, and Dodocool Bluetooth Headphones DA144 were cooperating, but it took me a while to get there. I would stick the headphones into a commuter category, as for fast-paced workouts I will pick something that isolates the wind noise more. I have tested the headphones in my front pockets, back pockets and side (knee level) pockets. While I had the Dodocool Bluetooth Headphones DA144 cut off on me a couple of times (again it lasts a split second), most of the time I was pretty content with the result. When connecting the headset to your phone, you may experience about 5-10sec of musing fading in and out until the connection is fully established but that never bothered me. I was able to make Skype calls, and the echo test came back positive, probably because the headset has the phone set profile as well as the audio device profile. One of the big advantages of the Dodocool Bluetooth Headphones DA144 is the design choice. Neckband design is rubbish for sit-ups or any similar activities where the neckband ends up hanging off your back. 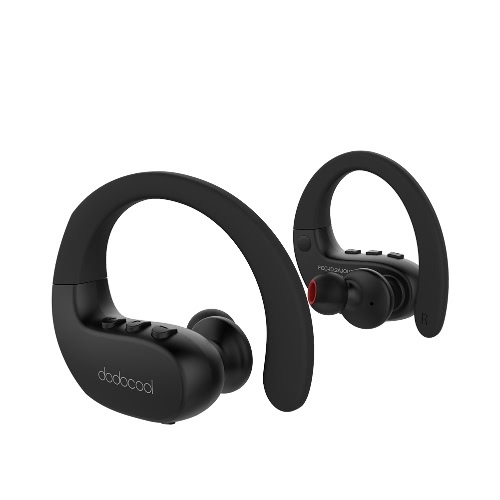 Dodocool Bluetooth Headphones DA144 stay where you put them regardless of the intensity or the orientation of the exercise. The Dodocool Bluetooth Headphones DA144 has been provided to me for the purpose of the review. As usual, with all my reviews I reserve the right to an honest critique of the product. Would I recommend the Dodocool Bluetooth Headphones DA144? I don’t think it’s for me. I could say yes if your main purpose is to have a completely wireless headset for a gym use. I will keep my LG Tone 730 as I’m an outdoor person. If you are happy with the tradeoffs listed by me – you could get a pair using the links below. Should product failed to meet your expectations Amazon got you covered.